1. Wash peanuts. set aside. 2. In a large pot, add chicken stock and water to boil. 3. Add peanuts to cook. 4. Simmer over low heat for 45 to 50 mins. I believed its in the peanuts itself. Once Benny bought a pack of peanuts and I cooked it the usual normal way. The soup is bland in taste. The peanuts is still hard and a bit bitter. The next time I went to the shop and ask the shop owner. The lady told me that I must get the rounded type of peanuts. the other type: long ones are use for non soup dishes. 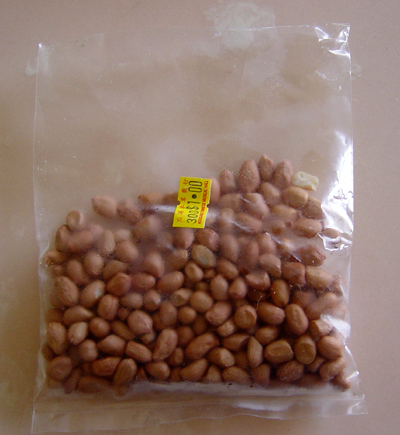 I think its the ShanDong Peanuts(the longer beans) that you cannot use for making soups. you are in Denver now? about peanuts, I cook it till its soft..not melt in the mouth type of softness. Could you update your profile to state your location? so others can know where in the world you are. Lilyng, Gina is right, I will normally have 2 types of peanuts at home, one for soup and another for fried. For soup, to have really soft nuts it's the timing of cooking. I don't cook it in the pressure cooker as I find the soup to be too diluted. Before we usually setup charcoal and I'll start cooking my soup from morning till 4pm but not anymore now for the mess and inconvenience. Now, I will cook it for about 3 hrs on my gas stove. Some mother's tales will ask you to put in a porcelain spoon to soften it at a faster pace. I usually make a similar peanut soup but instead of chicken stock, I use plain water and will add chicken feet to flavour the soup and I will add red dates too and simmer over medium-low heat for 3-4 hours. For chicken feet lovers, you get yummy, soft chicken feet and soup. My mum and MIL add one clove of unpeeled garlic, red dates and wolfberries for a stronger taste. That's what I do too. Can I use pork rib instead of chicken stock? do I need to soak the peanut? I tried to cook the peanuts for hours but it doesn't go soft. Hi Valerie, yes you can use pork ribs instead. Did you use the right type of peanuts ? You have to buy the rounded type (Gina mentioned it in the post, see above). This is what i do. I use a small pot and fill it with a little water just enough to cover the peanuts. Leave it to boil and add in some more water as it dries out. At the end of 1/2 - 3/4 hour, the peanuts will turn soft. Check the softness desired and you can use the peanuts for your peanut soup. I used this method for my glutinous rice peanuts as well. Gina, I used the type of peanuts u showed in the picture above but still get a bitter aftertaste... What should I do?